Salon Design - Space Planning - Consultation | Salon Interiors Inc.
Modern, Traditional, Minimalist, Natural, Feng Shui...What's Your Style? So many considerations go into what makes a salon design "great". First and foremost it must match your vision, and set the tone for the entire client experience. Looking to appeal to kids and families? Well, that's very different from what is needed in an exclusive spa setting. It's important to know just what special touches apply to what mood you wish to create. That's where over eighty years of combined design experience works for you. Our clients are paramount to our success, and we don't ever forget that. "Offering clients innovative fixture designs is a critical factor for success in the salon market." It's not just about furniture; It's about how we put it together with your vision and our design for you and your clients benefit. Personal attention to detail has been the hallmark of Salon Interiors' philosophy since it's inception over thirty years ago. Our founder saw a need to replace rudimentary and stale thinking in production. Anything stagnant and inefficient was swept out, to be replaced with fresh ideas and a broader approach to "outside the box" ideas. 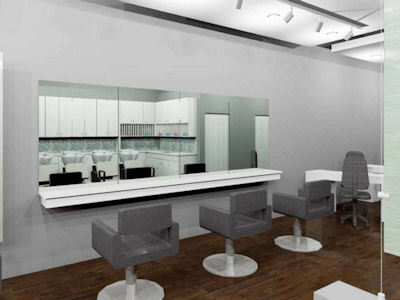 For stylists who want to be noted as unique to the services they provide, Salon Interiors has the edge in design and space planning. We know that salons need to show distinctive environments, since the first impression for the client is the most important. Started strictly as a distributor for major salon furniture brands, Salon Interiors soon expanded into innovative and individualized fixture design, with attention to detail in the space plan. Consistent with our design reasoning, furniture is customized to fit the needs of space, functionality and budget; all while reaching for new vistas. New ideas are continually developed, using the latest in finishes and materials and built to be in harmony with the tone and purpose of your salon. Salon Interiors has built our reputation on customer concern, for every client. From a sale of one or two pieces, to an entire salon opening, Salon Interiors offers an extensive selection of color choices, for all of the necessary fixtures in your salon. Attention to detail is key, and your satisfaction is our ultimate goal. Just as your clients don't come in for a haircut, Salon Interiors handles much more than just furniture. Call or come in for an initial consultation. We'll establish what mood your salon will set, select some basic furniture designs from our showroom and find out what services you'd like to offer to your clients. Based on the square footage of your space, we'll take a design deposit and make an appointment to come measure for your computerized floor plan. We'll supply you with a computerized design, showing furniture locations and indicating plumbing and electrical connections required. Once we've got the design that's perfect for you, we'll help you select the furniture called for in the plans, pick the colors and then we'll apply your deposit to the total order at the rate of $100.00 per $1,000.00 dollars of furniture ordered that's been shown on the print. You know that you deserve the best design attention available. Don't settle, come to Salon Interiors today and let our designers make your dream into your reality. Furnishing your new Salon isn’t comparable to furnishing your new home. When shopping around you will find that there are multiple options on the web, but no personal interaction. Making internet purchases may look like the most cost effective but who’s there for you when the purchase goes wrong? 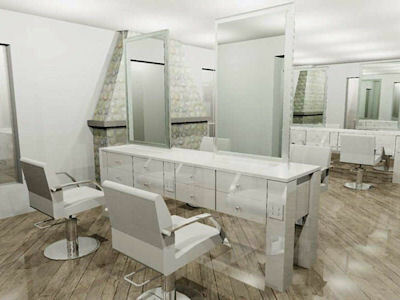 The needs for each salon are different and salon owners need someone on their side that knows the design and location. There is an increasing value to having a personal consultant that goes far beyond the initial furniture purchase. Salon Interiors is here to help make your salon successful and beautiful, unique and personal, profitable and finally an extension of you. What is your salon worth? 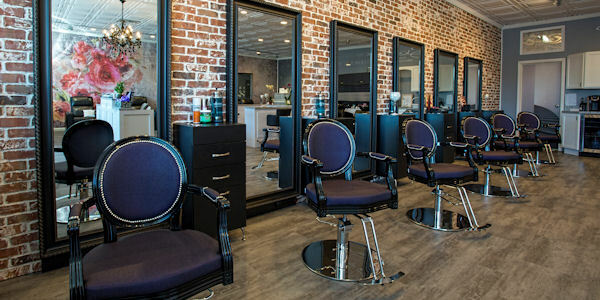 Consider Salon Interiors your Salon Stylist, we keep all your secrets, listen to all the concerns, fulfill your expectations and most importantly keep meticulous records of the individual work of art that is YOUR SALON. As a Stylist, you emphasize to your clients the value of having someone who is trained to care for them. With 35+ years of experience Salon Interiors has the expertise to care for your salon from the initial design to the finished product and far beyond. How long should your furniture last? When making an investment in your business ideally you want to get the most for your money. Furnishings provided by Salon Interiors withstand the test of time, we provide quality and experienced workmanship that can look fresh for years. Our Salon designs are timeless, elegant, and durable. Salons we have designed up to a decade ago are still fresh and clean today. With that kind of longevity you can focus on your clients and your profitability. How do you know the product fits your expectations? A picture can say a thousand things but it can’t feel. Our large showroom will give you the opportunity to touch, sit and feel your furniture for comfort and quality prior to being surprised with the end result. Not all chairs are alike! Being able to see the cushions, pump the base and get an idea of the seat width is not only crucial but necessary to a satisfactory purchase. Furniture quality is a focal point, how thick is the material? Will it chip easily? Are the drawers deep enough? How about the drawer slides – do they open enough, are they smooth gliding? Make sure you get what you pay for! Pieces on a screen are determined by the resolution of the machine not the actual finished product. How unique do you want to be? You have spent countless hours looking around. Even more time looking thru magazines and surfing the web. You know what you like and have a concept of what represents you. Your Salon/Spa is an extension of your knowledge, experience, talent and personality. Salon Interiors can make your vision a reality. Custom furnishings are important to your success and make you stand out. Clients are looking for the full experience, quality and comfort in the space are intertwined with the atmosphere and talent. Future staff are looking for a location where they can bring their following, pride is in the product. Salon Interiors has the experience to fit all budgets and needs. Careful consideration and interaction will determine where your money is best spent. Numerous factors play into the perfect design for your salon. Our consultants will review your space, listen to your needs, and explain how far your budget can take you. Consult with our experts to be best informed on where the return on investment is optimized. Salon Interiors will explain in detail all your options including finance, after you are fully aware of every option, then we will make all the pieces fit together. Who can you turn to in times of need? You have made your vision a reality and have been happy with the overall look of your salon for years, but times have changed and services that were profitable are now extinct. A whole new set of services have become the newest rage and you need to update part of your space. This is when Salon Interiors, your Salon Stylist, is of the greatest value. Our consultants and master woodworkers will be able to match your existing furnishings with a complimentary piece to keep your salon flow consistent. We will be able to remove the area that is antiquated and replace it with matching new pieces that mimic or exactly match the original design, sometimes without even interfering with operating hours. Sometimes a purchase is NOT just a purchase, but more of an investment in your future. Salon Interiors prides itself on our references, we have made hundreds of thousands dreams come true. Quality, experience and one on one interaction can never be undervalued. Always work with someone you can trust and have confidence that the end result is exactly what you envisioned!